7 Search Results for "#PMI’s Pulse of the Profession"
Boss: I heard that your team has not started designing the new application, yet! Dev: We have not yet got any clear user requirements on this project..everything is vague and ambigious..
Boss: Mr.Dev, we don’t have time to gather requirements. It’s a tight deadline.. So start working on it right away! Dev (thinking): There is definitely no time to gather requirements but now I need time to gather my wits to figure how to start this project. Requirements are involved in many issues that cause project failure, including scope creep, poor communication, lack of stakeholder involvement and inadequate sponsor support. PMI’s Pulse of the Profession* study revealed that nearly half (47 percent) of unsuccessful projects fail to meet goals due to inaccurate requirements management. Project Manager: I heard we are doing this "In Sync" project. Is it true? Boss: Yes. But why are you asking? What's the matter?? Project Manager: It doesn't align with the overall business goals and strategy of our company that was proposed at the beginning of the year. So..is there any point in doing? Boss: (thinking) How do I tell you? It is going to make my image look good. Of course, that's why! Aligning Strategy and Implementation In a business world of constant change and disruption, c-level executives will increasingly need to call on their project management offices to insure high alignment of projects to organizational strategy. Boss: How is Project "Tight Rope Walk" coming along? Project Manager: So far, So good! Boss: Sorry to say this, but it won't be good for long. 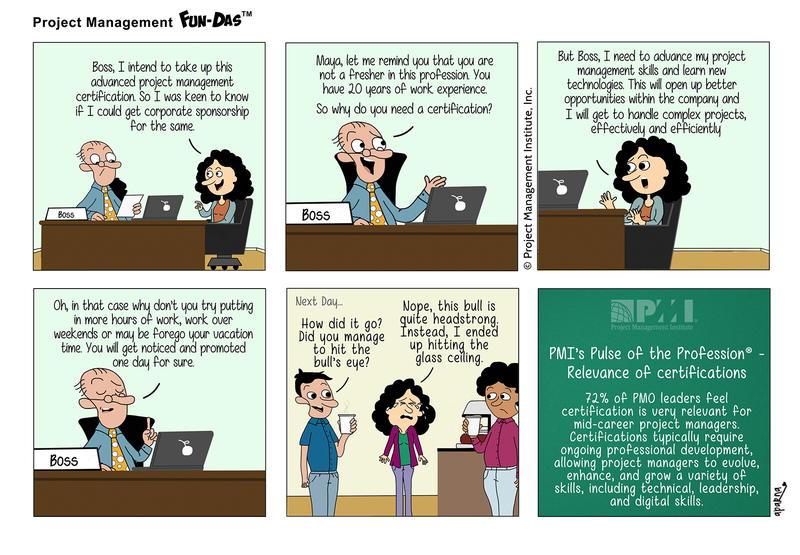 Project Manager: Errr! But Why? Boss: Let's just say that we are putting the project on hold due to circumstances beyond our control. Project Manager: ???!!? Boss: Nevertheless, we have now identified a new project for you. Project Manager: Hope this project does not meet the same fate as the earlier projects that I was assigned. Boss: Don't worry. Changes are inevitable in an uncertain economy. I wish you all the best! Project Manager: Thank you! PMI's Pulse of the Profession: The High Cost of Low Perfromance found less than half (42 percent) of organizations report high alignment of projects to organizational strategy. That's simply not good enough in today's hyper-volatile business world.